Thx for maintenance this tools for us markwkidd. my ones are much compatibility wide set for 0.175 not the proper 0.174 so… if someone got proper rom set for 0.174, contribute some for libretro-database please. One update on the “Not Working” filter bug – SAM does correctly filter out romsets if they are marked Unplayable in the catver.ini but it must not be correctly parsing the “Not Working” tags in the DAT file. In other words there is at least partial functionality. I love this tool, useful but the GUI can be pretty confusing, for example I’m creating playlists for my Vita and it’s really hard to figure out what it means by what paths etc. Aside from that my main issue is that the playlists don’t seem to get associated with a certain system, whereas within retroarch if I generate a mega drive playlist it will put a little megadrive controller icon on top of the playlist whereas these generated ones just have a blank icon. What gives? The playlist icons are purely determined by the filename you give your playlist. The filename needs to exactly match the name of retroarch’s icon set for that particular system. If you name that playlist Sega - Mega Drive - Genesis.lpl you should get a proper icon. Honestly you will probably get more help with these issues outside of the Playlist Buddy thread. However I will say that it is possible to have playlist icons in addition to the default ones included with RetroArch. If you created a playlist called Fun Games and you wanted to add icons to RetroSystem, you would add Fun Games.png and Fun Games-content.png to that folder. Either way, thank you for building and maintaining this utility! Hey there. i think i got this going and am using the experimental thumbnails… i got 2 libraries done correctly. my nes and super nes, they load properly in retroarch, and show thumbnails. now im trying to do sega and gameboy in the same fashion. only problem? all the png files its making is 1 kb and not a valid picture. 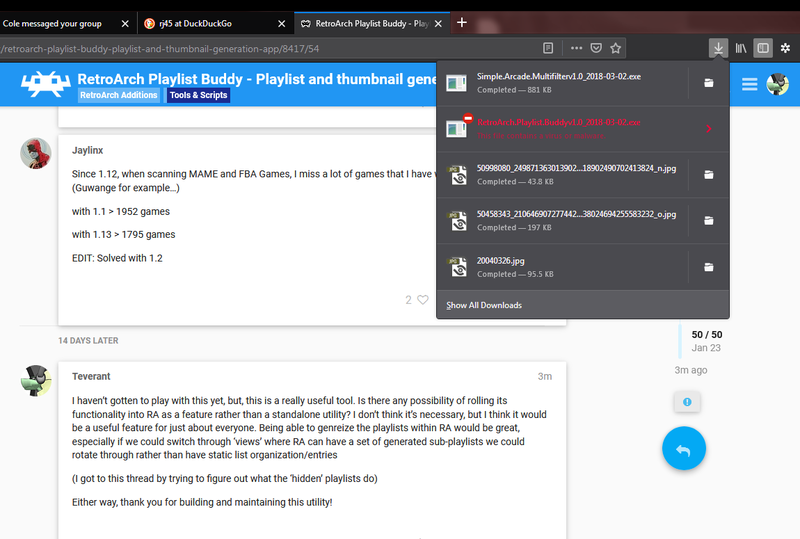 all the links look correct in the playlist file. is there a problem on my end? i made two playlists successfully. the ones i made for sega and gameboy load properly in retroarch, and have lag like the picture should display, but looking at the png files its generated, they are bunk. Ok I understand what you mean…but the libretro thumbnails are already renamed accordingly as per metadata…the problem is that my 3d thumbnails are named like sf2hf.png and I would like to rename them to full name for retroarch,is that possible? When set that way, this tool does rename the thumbnail from Mame filenames to RetroArch style by looking them up in the XML DAT. I’m having trouble understanding exactly how you are configuring it, could you post a screenshot of the settings your are using?